Following recent weeks’ links to ex-Gerrard team mate Martin Skrtel (which his agent again has dismissed as a non-starter financially) Rangers are still on the lookout for a new defender. Joe Worrall has made it clear he’s heading back to Forest, Gareth McAuley will not last forever, Nikola Katic’s form is pretty patchy these days and Connor Goldson has some health issues right now. 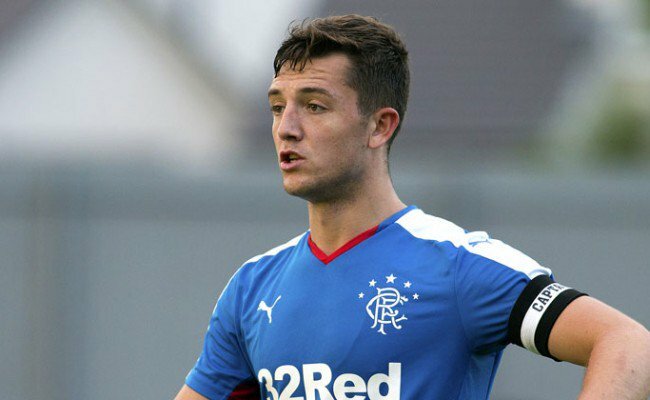 Rangers need someone who isn’t going to cost the earth and who’ll hit the ground running in January – and there’s been more than a touch of talk about our ‘very own’ Craig Halkett (he’s a self-confessed fan) making a return given his stellar displays for Livi and Rangers’ need for quality in his position. As we know Halkett is a ‘failed’ Rangers youth who wasn’t deemed good enough to hold onto. It’s not his fault – a lot of these freed players are mistakes who go onto have great careers and make fans wish they were still at Ibrox and had been raised fully and given the chance. He was a big one – only free barely three years ago, Halkett has been outstanding for Livi as a free agent and Rangers may well have made quite a big boo boo in letting him go. Nevertheless the tough no-nonsense centre half, who’s still only 23 incidentally, feels he has a point to prove against us tomorrow and we disagree. He doesn’t – he’s already proven he’s got what it takes to deliver in the SPL, and we know Gary Holt rates him very, very highly, especially given he’s his captain. Craig Halkett has nothing to prove to us. However, whether he could take the weight of the shirt is another question – it is a big responsibility which not all can tolerate. But a healthy and fair bid for him in January and Steven Gerrard could well have a player in defence who truly understands Rangers, supports us, and acknowledges the demands. That’s, if he wants him. Perhaps he’d rather try spending £60K a week on a 33 year old? We need a good few of these players gone mate. As I said earlier our squad is starting to get congested. And the wage bill just keeps getting bigger and bigger all the time at some point we are going to hit a brick wall finance wise excluding the 14 million quid for equity we are still in a bad way mate let's not deny this. He's too small for central defence. Right back maybe. Off topic here but if Celtic refuse those 800 tickets from us and it's put out there it's been done for safety reasons them refusing to take them does anyone think that could look bad for our club. With tickets allocation cut back for European teams coming to our ground as well a think people might get the wrong idea about out great and famous club . I'm all for good value. If he can do the job, it makes sense. We ned to recoup some £££ by getting rid of the likes of Pena, in January. No space for dead-wood and bad purchases, this season. We can't afford to 'carry' anyone.